1. Please tell us about your Linguistics Background. I remember being interested in linguistics when I was in high school, but I didn’t know much about it. I found Benjamin Lee Whorf’s book exciting, and I liked reading about etymologies. But it wasn’t till I went to college — I was at Swarthmore — that I Iearned what linguistics really was, from Lila Gleitman, who taught at Swarthmore while I was an undergrad. She was a great inspiration, and I was completely swept away intellectually by Chomsky’s Aspects and Haj Ross’s thesis. I wrote an undergraduate thesis on generative semantics and how its methods would have interested Leibniz if he were still alive. I went to MIT for grad school, and found everything there of interest: the main things that people were working on were syntax and phonology, and I learned as much as I could; I was also interested in doing a sort of conceptual semantics inspired by Whorf and by Heidegger, and wrote a couple of papers along those lines with my classmate Erich Woisetschlaeger. I enjoyed working with Morris Halle, so I wrote a dissertation with him, on what I called “autosegmental phonology.” That led me to African linguistics, and to Bantu tone languages; these tonal systems have got to be among humankind’s most marvellous cultural constructions. In 1976 I began teaching at Indiana University, where the chair was Fred Householder, who had a very appealing open mind to linguistic ideas. I more or less left the work I had done with Erich on semantics — maybe because it was too far from the interests of others in that field — and was primarily interested in syntax. This was the time when Joe Emonds’s work seemed to many as the future of the field, as did Gerald Gazdar’s. In the 1980s I moved to working primarily on phonology, with a lot of work on Bantu tone languages, culminating with two not unrelated models, dynamic computational models (inspired by structured neural nets) and harmonic phonology. In the 1990s, I moved to working on computational issues, with a primary emphasis on developing methods to induce grammar in an unsupervised way (which means developing software that induces a grammar on the basis of data provided to it). I moved to the University of Chicago in 1984, which was a wonderful opportunity for me. 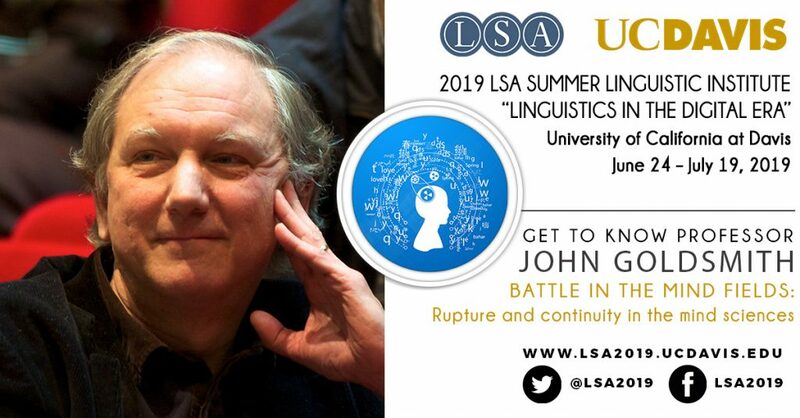 I have been working in the area of unsupervised learning of morphology for twenty years, under the general rubric of the Linguistica project. At the same time, I became quite interested in the history of linguistics and in our field’s relationship with neighboring disciplines, such as psychology and philosophy. I wrote a book with Geoff Huck in the mid 1990s on the generative and interpretive semantics. Geoff and I had begun with the idea of looking at the field in the 1950s, but at the time it seemed like too hot and steamy a topic. A few years later, I began an ambitious project with Bernard Laks, a French colleague, which has so far produced a couple of papers, and the book that I will be teaching at the Institute, Battle in the Mind Fields (University of Chicago Press, 2018). Battle covers the period from the early 1800s up to World War II, and we are writing the second volume now, Confrontation in the Mind Fields, about the next thirty years or so. I joined the LSA in 1975, when I when to my first LSA meeting, in San Francisco, to participate in the job interviews. I had attended the LSA Institute at UMass in 1974. The course I’ll teach at the Institute will cover the main themes of Battle in the Mind Fields: the differences between study the personal and social dynamics of a field and studying the evolution of the ideas, the importance of seeing the ideas within one field in the broader context of the neighboring disciplines, and the importance of reading what people wrote carefully. The simple decision to read the work of linguists in the past has changed my view of linguistics drastically, and dramatically. Many of the most influential linguists of the past are misrepresented in important and fundamental ways, and it is we ourselves who are the poorer for allowing this to be. Each generation needs to make the effort to rethink its history, and to reappropriate that history for itself, in a way that it chooses. That’s the central theme of the course. I’ll cover Battle in six classes (just picking out some highlights), and then bring the story closer to home in the final two classes. 4. What advice would you give to graduate students interested in pursuing a career in linguistics? I’m not sure that we can speak of pursuing a career in linguistics. There are careers in academia and careers in industry that allow people to pursue their intellectual interests in linguistics, and both have their very positive sides to them. I’ve certainly been extremely lucky — or blessed — in the opportunities that I’ve had, and it’s hard for me to imagine a career path that would have been more satisfying than the one I’ve ended up taking. But academia is a risky business in some ways for junior scholars. The most important thing a young person can do is to talk with older people about the choices that they have made, and what they have learned from those choices. The summer LSA institutes are a great place to do this. Learn more about Professor Goldsmith here.